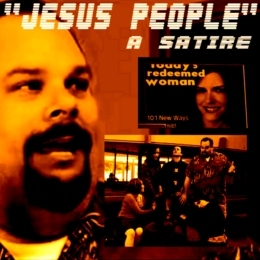 WWW, May 2008 - Even without knowing the details about the real people and events (discussed) in the video, the satire "Jesus People" unmistakably shows the hypocrisy, vanity and essential unchristian nature of the Christian Industrial Complex. A pastor, his wife, and four ambitious artists who want to make it in the Christian Industrial Complex form the backbone of the "Jesus People" story. The pastor guides the artists and introduces them to other celebs in the market where Christianity is spelled Chri$tianity. Obviously no co-incidence: the pastor looks like Rick Warren and one of the artists speaks about how her former husband ruined her career in the Christian Market before: those in-the-know will recognize similarities with Amy Grant. But even without knowing (some) details concerning the true events and people that inspired the makers of "Jesus People", the viewer of the video will recognize how little exaggeration is applied. Completely unnecessary, as the Christian Industrial Complex in itself makes a mockery out of the true Christian faith. Time for a smile, and -when you know yourself to be involved in the Christian Industrial Complex- perhaps time to realize how blasphemic this complex is, in reality. For it is obvious that the makers of the video know the difference between the Industry and the faith better than many who call themselves "Christian".